April 5, 2017 (Atlanta) — Georgia Urology’s Dr. Lambda Msezane was featured in a career panel honoring Women’s History Month. The Office of Inclusion & Diversity at Marist School, Dr. Msezane’s alma mater, hosted the panel on Thursday, March 23rd, at the Ivy Street Lecture Hall. 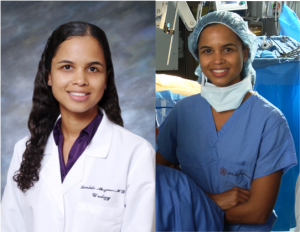 Dr. Msezane, along with two other women, discussed how they overcame the gender gap in multiple fields, including the often male-dominated urology. Dr. Msezane earned her Bachelor of Arts degree from the coveted Princeton University and her Doctor of Medicine degree from Temple University in Philadelphia. On top of her impressive education, Dr. Msezane has also earned a plethora of awards, including the American Urology Association’s Travel Urology Award and the Schoenberg Research Scholar Award at the University of Chicago for her research on prostate, urothelial biology, and bladder cancer. The panel provided an opportunity for students to learn about the successes of women in the workforce. Dr. Msezane encouraged other young women to follow in her footsteps in accomplishing their goals regardless of their gender. To learn more about Dr. Lambda Msezane, click here. Make an appointment with Dr. Msezane today.